Sorry I am a bit late on this one.. I haven't been at the computer too much since Thursday.. so I didn't get a chance to post these up for Friday.. forgiveness please!! Also. I hate these nails. I had no inspiration for them.. and I didn't feel like doing black bats.. so.. I just did some Zombie Zest bats.. and not very well, might I add! 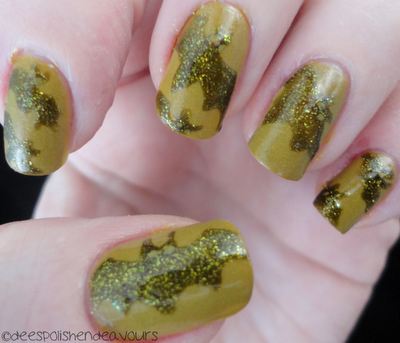 The base is China Glaze Trendsetter and the bats are China Glaze Zombie Zest. That is all! Make sure you check out the other awesome gals taking part in this challenge! !